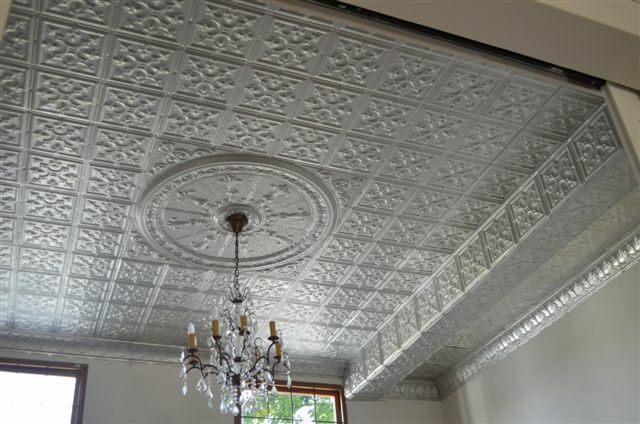 If the vintage ceiling tile is preferred to be unpainted or in 'natural' colour, as it is sometimes called, it is still necessary to protect it with a clear varnish or similar paint/cover to prevent it from tarnishing. In this picture one of our clients installed the unpainted pannels in a room with very good natural light and a chandelier. This picture also shows a bulk head where the filler of the vintage ceiling tiles is wrapped aound the bulkhead. Having the option to pain cailing tiles in any colour or leave then unpainted gives you a very wide variety of options when decorating your home. This gives your home or room a very unique personality. 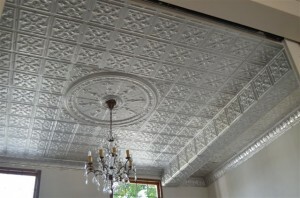 Even though many people see the vintage ceiling tiles as old fashioned they can easily be made very modern.